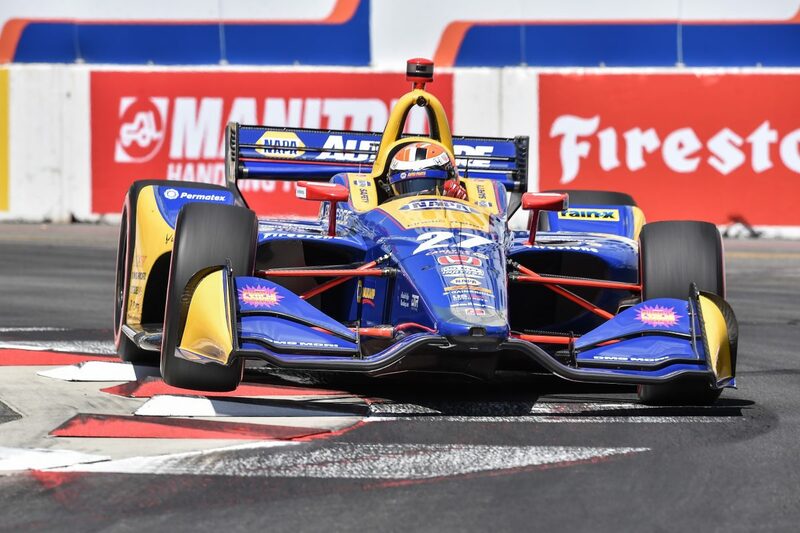 Andretti Autosport’s Alexander Rossi has taken back-to-back Long Beach IndyCar poles after snatching top spot from Scott Dixon in the dying moments. Dixon will start on the front row but a miscommunication may have cost the five-time champion pole. The Chip Ganassi Racing driver set a 1:06.7479s on his first flyer and was two tenths up on that time during his second lap. However, Dixon bailed out of the attempt and came to pit lane, leaving the track open for Rossi. “It was kind of an interesting run, I felt like I nailed the first lap pretty good,” said Dixon. “It seems like the others chose to do two runs, two sets of reds, which may hurt them tomorrow. Last year’s pole-sitter and race winner took full advantage of the open track and came across the line to set a 1:06.4811s, just over two tenths faster than the New Zealander. The three Team Penske cars will take up third to fifth on the grid, with the #12 Chevrolet of Will Power leading the team. Power was pleased to make the top six, let alone secure a second row start after finishing a highest of 10th in the three practice sessions. “I was really happy to make it to the Fast 6, I was almost out of the top 10 in every session,” said the Queenslander. “Great effort by the guys to get a good car. Amazing lap by Rossi to do that, and I don’t know how he did that; that’s pretty cool. Championship leader Josef Newgarden will start beside Power on the second row with team-mate Pagenaud behind them. Rahal Letterman Lanigan Racing’s Graham Rahal rounded out the third row on the grid in the #15 Honda. Rahal made the Fast 6 by virtue of Chip Ganassi rookie Felix Rosenqvist bringing out the red flag in the second qualifying session. Rosenqvist locked up and made contact with the tyre wall at Turn 9, ending his hopes of advancing and putting the Swedish driver in 12th for tomorrow’s race. Tony Kannan also had his time erased for an incident in Round 1 where the AJ Foyt Racing driver slid into the tyres and will line up 21st. The Grand Prix of Long Beach is scheduled to start at 0630 AEST tomorrow morning.